Since version 1.3.0 the popular strongSwan Android VPN Client allows the collection of integrity measurements on Android 4.x devices. A special Android BYOD IMC written in Java communicates via the TNC IF-M 1.0 Measurement protocol with an Operating System IMV and a Port Scanner IMV. The strongSwan Android VPN Client transports the IF-M messages (RFC 5792 PA-TNC) in IF-TNCCS 2.0 Client/Server protocol batches (RFC 5793 PB-TNC) via the IF-T for Tunneled EAP Methods 1.1 Transport protocol protected by IKEv2 EAP-TTLS. The hostname of the VPN gateway is byod.strongswan.org. 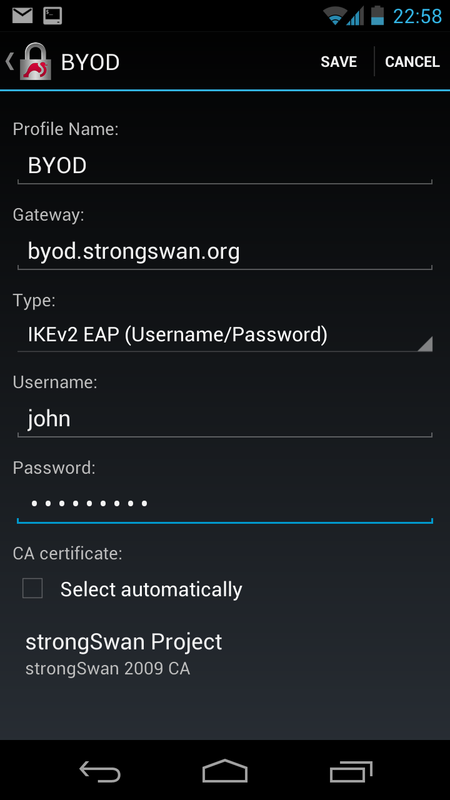 The user authentication is based on IKEv2 EAP-MD5. Possible user names are john or jane and the user password is byod-test. The byod.strongswan.org server certificate is issued by the strongSwan 2009 certification authority. 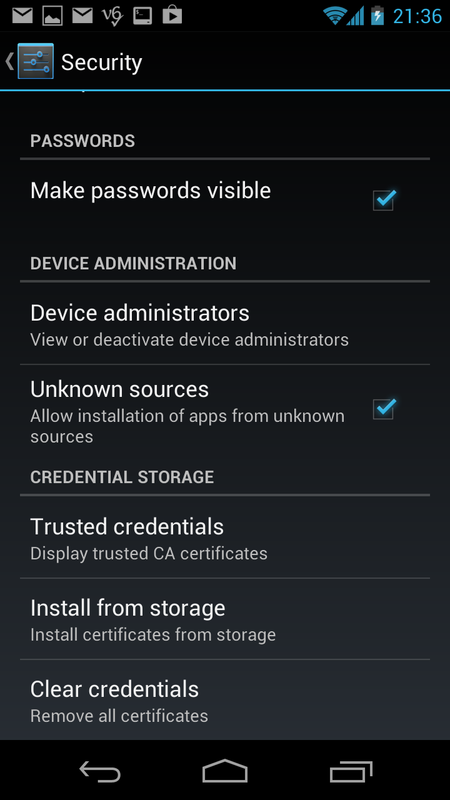 Therefore the strongSwan 2009 CA certificate must be imported into the Android certificate trust store before the first connection can be attempted. If the BYOD IMC (Integrity Measurement Collector) does not detect and report any security issues to the OS, Scanner and Attestation IMVs (Integrity Measurement Verifiers) via the IF-M message protocol then the TNC Server located in the combinded strongSwan PDP/PEP decides to give the VPN client full access to the corporate network. The BYOD IMC first reports the Android OS version via the IETF Product Information and String Version PA-TNC attributes. The OS IMV then requests a list of Installed Packages and some Android OS Settings via an IETF Attribute Request and an ITA-HSR Get Settings PA-TNC attribute, respectively. The Installed Packages are compared against a reference list stored in the database. The TNC measurements showed compliance and user john is allowed into the corporate network. 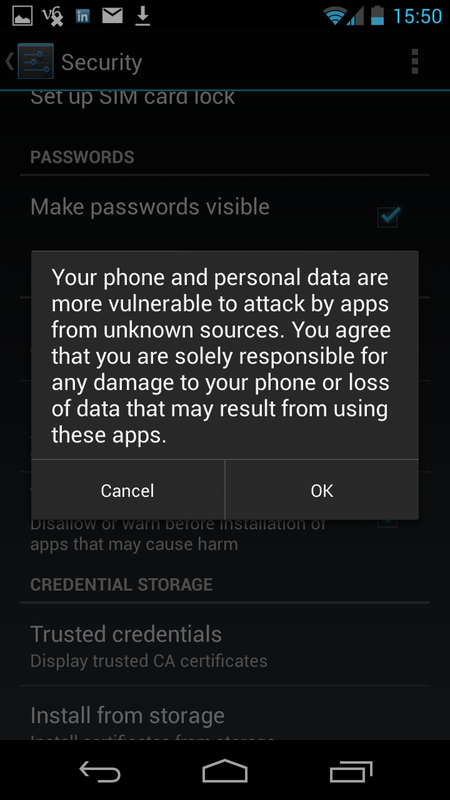 If the Unknown sources flag is activated in the Settings/Security configuration menu of the Android device then a user might be lured into downloading malicious Apps via manipulated links. Setting this flag therefore poses a grave security risk. The user also decides to download and install an Android Web Server from the official Google play store. The next time John tries to access his home network, he is granted only restricted access and his VPN Client is directed to a remediation network. This causes an IETF Assessment Result and two IETF Remediation Instructions PA-TNC attributes to be sent to the BYOD IMC and a PB-TNC Reason String to the TNC Client. The TNC measurements shows minor issues with compliance and user john is relegated into an isolation network. Since this poses a severe security breach, user John is blocked from accessing the network and the VPN connection setup fails. The BYOD IMC detected a server listening on TCP port 8080 and sends this information via an IETF Port Filter PA-TNC attribute to the Scanner IMV. Remediation Instructions are sent to the BYOD IMC. The TNC measurement shows major issues with compliance due to the open server port and user john is denied network access.